(Leah Hogsten | The Salt Lake Tribune) l-r Salt Lake City council chair Erin Mendenhall, Mayor Jackie Biskupski and Mike Reberg, director of the Department of Community and Neighborhoods met with the Salt Lake Tribune editorial board to discuss the mayor's proposed sales tax increase and bond issue for city roads, Wednesday, April 11, 2018. With Salt Lake City finding significant public support for new spending to fix streets, add police, subsidize housing and improve transit, the roadshow that Mayor Jackie Biskupski and other city officials have embarked on to promote the plan is starting to look like a victory lap. That outreach tour stopped Wednesday at The Salt Lake Tribune as the mayor and City Council Chairwoman Erin Mendenhall, joined by aides and department heads, outlined the city’s twin revenue proposals and how the money would be used. Though the plans appear to have won broad backing, the mayor and council leader have not slowed down on selling them. The council is poised to approve a 0.5 percent sales tax increase — equal to a nickel on every $10 spent — as early as next week that would generate $33 million in new money annually. The council is also on track in the coming months to authorize a November referendum seeking voter approval for an $87 million bond to fund up to 10 years of catch-up road repairs. City officials have made the rounds of constituent meetings largely with the winds of public sentiment at their backs: Programs that the new revenue would pay for are popular, have been well-publicized, and, in a way, thoroughly test-marketed. The city has surveyed residents on the spending priorities — housing, transit, public safety and streets. It has done direct mailings, met with business groups and community councils, held public forums and hearings, and created a website where visitors can review the proposals and take another survey. “We’re seeing about 70 percent support rate for us to implement this sales tax [increase], pursue the bond, and pursue implementation of our plans that we’ve created over the last couple years,” the mayor told Tribune editors Wednesday. With more than 1,700 responses recorded as of Wednesday morning, the website survey has notched 68 percent support for both the sales tax hike and the bond, according to the city. It also registered outsized majorities supporting road repairs (86 percent), improved east-west bus routes (66 percent), more affordable housing (71 percent) and more public safety spending (65 percent). Those numbers mirror polling the city did in January. Business leaders, in meetings with the city, have expressed concern about the seeming haste to enact the sales tax increase and the appearance that it is a done deal. Biskupski and Mendenhall touted some of the city’s main selling points and their associated costs. 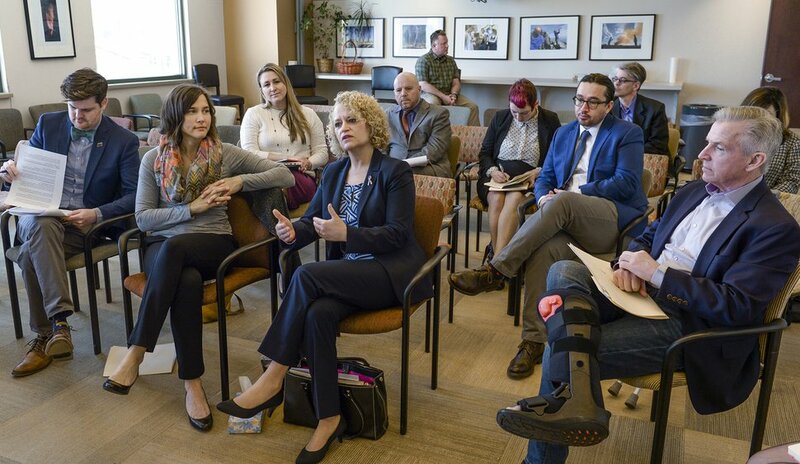 (Leah Hogsten | The Salt Lake Tribune) Salt Lake City Mayor Jackie Biskupski, center, with City Council Chairwoman Erin Mendenhall, met with the Salt Lake Tribune editorial board Wednesday, April 11, 2018, to discuss a proposed city sales tax increase and bond issue for city roads. Joining them are, at far left, City Councilman Chris Wharton, and members of the mayor's administration and council staff. • The sales tax increase is a fairer way to spread the costs of road and transit improvements and stepped-up public safety among a larger population that benefits from those improvements, including tourists, commuters and other nonresidents. Sixty percent of sales tax revenue comes from purchases by people who don’t live in Utah’s capital. • The 50 new police officers, among 63 total new public safety hires, would allow for the creation of 23 new community policing beats. • The new money for roads would more than double the amount of maintenance the city could do each year — from 75 to 155 lane miles. • Expanded, more frequent and dependable transit could allow a family to give up one car and save $11,000 a year.